Can you resist eating these delicious Dolce Mal chocolates? HealthCare atHOME (HCAH) has launched a new campaign to raise awareness on the risks to people with diabetes that remain in diets high in sugar. 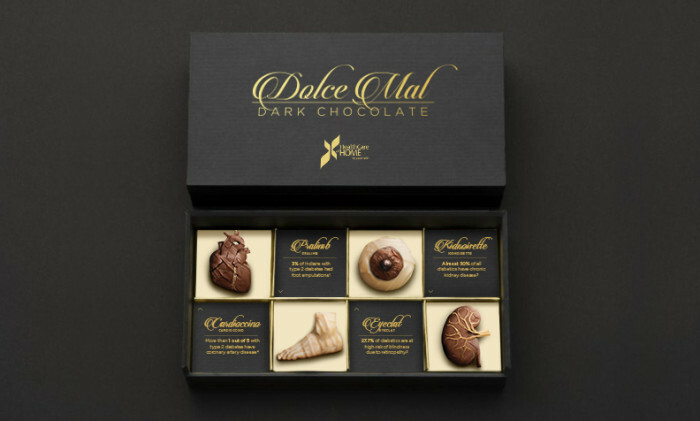 To get patients to realise the importance of management of Diabetes, HCAH partnered with McCann Health to create Dolce Mal, a brand of chocolates hand-crafted to get people not to eat them. Each piece was shaped like a body part that could be damaged if a patient with diabetes maintained a diet high in sugar. Facts about the likelihood of developing diabetes-produced problems were placed next to them. Dolce Mal was launched in the week of World Diabetes Day at the HT Palate Fest, a three-day food festival in New Delhi, to promote HCAH’s diabetes management app, DIABEE, and has been distributed to over 500 HCPs in North India, with roll-outs continuing until the end of the year across North and West India. One of the country’s largest real estate investment and development events has appointed MEC as its media agency. ..